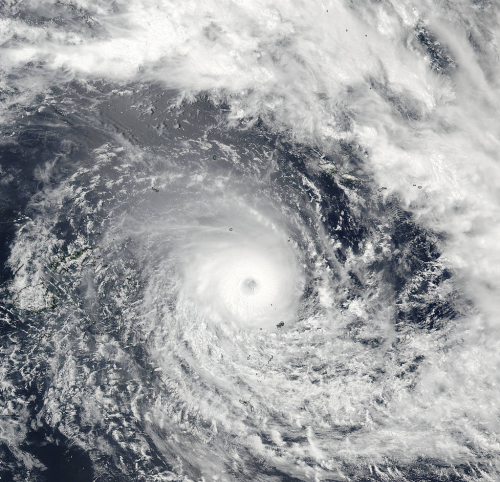 The storm was carrying average winds of 230 kilometres per hour [143 mph], with gusts of up to 325 kilometres per hour [202 mph], Fiji's Meteorological Service said. If you want to know what that feels like, put your hand out of the window when you are driving at 195 mph (315 kph) if you are allowed to drive at that speed anywhere. Be careful, you'll probably lose your hand. Winston is tracking north of its previous forecast track, and is now expected to make landfall on Fiji's second largest island, Vanua Levu, near Nambouwalu at approximately 0600 UTC (1 am EST) Saturday, as a Category 5 storm with 185 mph winds, according to the Joint Typhoon Warning Center (JTWC). This would make Winston the strongest tropical cyclone ever recorded in the South Pacific waters east of Australia. The Fiji government has mandated a curfew across all of Fiji from 6:00 pm local time. It has also declared a national disaster from now to 30 days out, according to the ABC. There are 758 evacuation centres. If you're in the path of Winston, do take care and go somewhere safe. It's a monster of a storm. We just had a nice little snowstorm with about 40cm of snow which came close to shutting down the city. After seeing that rain sweeping down the road in the second video, I think I am getting to like snow a lot more. 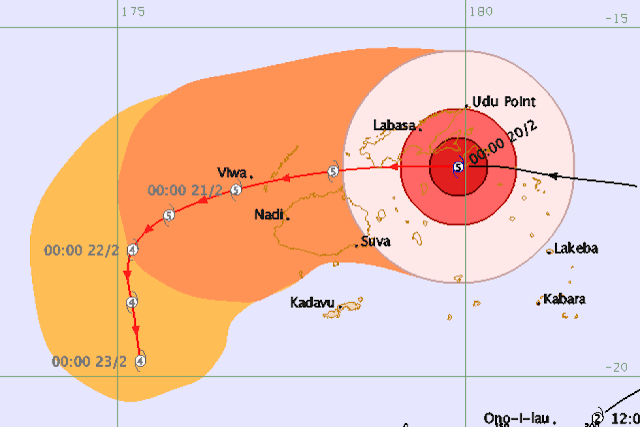 Do Fijians have decent storm shelters for such an unprecedented storm? My first impulse would be head for the cellar but do they even exist there? I remember trying to explain/rationalize to an Australian housing official why Canada had basements. I don't think there are too many basements in Fiji, JKR, except for underground carparks perhaps. I don't know that I'd be rushing to a basement, I'd fear being drowned with the storm surge, and/or electrocuted while standing knee-deep (or neck-deep or worse) in water. High ground and a sturdy building would be my choice. I think they improvise the shelters ie have some buildings that are built storm proof that are used as regular buildings. I saw a photo of hotel guests sheltering in the hotel ballroom. I live a long way inland and never thought of storm surge. Storm surges happen 300 or so km from here if you go east. Re electrocution. I just assumed the power was out by then but it is not that hard to throw the switch--usually found in the basement in Canada if you have to be down there anyway. It's street power lines falling into flood water that can cause electrocution, more so than anything in the house (which here would have circuit breakers). Lol record setting?From when records start? As Gilles Vigneault put it "Mon pays,ce n'est pas un pays, c'est l'hiver". Or a quick and dirty translation, "My country, it's not a country, it's winter". Winter is a bit tepid these days. Felt like April today, not the depth of February. 27 degrees C and sunny here in the SF Bay Area of California two days ago. That on the heels of a proper thunderstorm the night before. Probably not unheard of for an El Nino winter, but still a little WTF-worthy. I'd be surprised if it were a southern hemisphere record. TC Monica cracked a 8.0 on ADT (see http://tropic.ssec.wisc.edu/real-time/adt/archive2006/23P-list.txt) where TC Winston made it to 7.3 (http://tropic.ssec.wisc.edu/real-time/adt/11P-list.txt). Never the less that is right up there in terms of intensity. Was following this for some days; below link to a variety of pictures. Aside from power outages and 10 deaths, and quite a bit else, oddly it seemed quite a few structures were still intact. Seems the Fijians on the whole had pretty good building standards. The best reporting in our US news blackout (until recently) was from Al Jazeera. No surprises, they're shutting down later this spring. We don't want to know, I guess. Given a brief period of sustained winds at 185 mph, lots more over 150, I would have expected something more like Haiyan. More shelter in the terrain as well, perhaps. It could have been worse if not for the warnings and preparation, but it was pretty bad. Now 17 reported killed and whole villages wiped out. 680 plus homes destroyed. I expect reports are still coming in from some regions.